We can offer you any of the services you may need for shipping to any of the five continents, all this backed by our membership with the most important removal and transport associations in Europe e.g.FEDEM FEDEMAC FEVET. You can rest assured your consignments however small or large will only be packed by our qualified personnel, using homologue packing materials to ensure they will arrive safely at their destination. 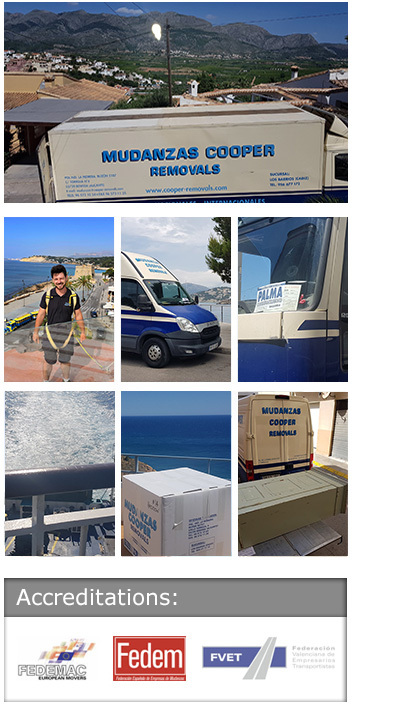 We also offer a groupage service that connects most of the cities in Spain, France and the U.K.
We pride ourselves on our International Shipping Service. Whether it is a small package or a full household we are able to handle it with care and efficiency. Our skilled packers will make sure your effects are fully packed and protected. A worldwide network of agents will, at your destination, organise customs clearance, delivery. We have access to export groupage services which help to keep costs down and speed transit up. World-wide services by sea, air and road. The type of service used to transport your belongings depends on various factors. This will be discussed with you by our representative when we visit your home. When calculating the cost of your move, we consider all options, and give you the information needed to help you decide what best meets your requirements. Whether it be Australia, Canada, New Zealand or wherever you want to move worldwide we can take your furniture and personal effects there. Our international services include specialist export packing, listing, labeling, loading, shipping, customs clearance, delivery, unpacking, setting-up, removal of packing debris and full liability cover. As a company we send both airfreight and sea-freight around the world on a regular basis using only the very best shipping lines, agents, packing materials, labels, containers and high security seals ensuring that each consignment arrives at its destination in first class condition.